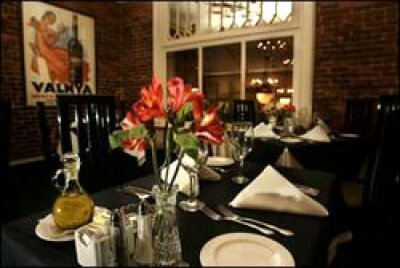 I'm often asked to recommend restaurants and the question I like the least is, "Are there any good Italian restaurants in Nashville?" It's a troublesome question because the quick and easy answer is no, not like the best new wave of Italian restaurants of the Mario Batali variety. One place that has tried to take stabs at the classic, white tablecloth standard of Italian dining is Valentino's Ristorante. Their rich lasagna was a pretty good benchmark, but many dishes seemed mired in an era of sauces that cloaked the dishes like a thick cashmere overcoat. I just hadn't been excited about Valentino's for long enough that it fell off my radar. Then reports started trickling in from diners who had visited recently and had very good experiences. Like warm whispers laden with wine, the reports continued, becoming more intriguing, and from people whose opinions I respected. Well, of course I had to go find out for myself. Now, after a couple visits, I've joined the ranks of believers. Don't take this column as a whisper, though. It's a shout. About four months ago, 34-year-old Paolo Tramontano joined the kitchen, put in place to relieve Sime Glavin, the long-time Croatian-born chef who was looking to scale back. After stints around town and at restaurants in New York, notably at MoMA, the Museum of Modern Art, I can only hope that Tramontano has landed in a culinary tenure track. His voice on the phone is thick with strains of his former home in Naples, where he learned to cook. He is slowly making the menu his own, primarily with specials, but you can taste his influence across the plates. Start with his homemade salsiccia con mozzarella affumicata. Salsiccia is what the sweet Italian sausage you buy at the store is supposed to taste like. The spices and herbs, more redolent of sweet flavors of nutmeg than just a tongue-pounding of fennel seeds, taste so bright and fresh in the split and grilled pieces of ground pork sausage. It arrives tender and lightly covered with slivers of melted, smoked mozzarella. Don't miss it. The simple carpaccio di manzo, raw beef sliced so thinly that it falls apart on the tine, is kissed with a light drizzle of citrus and oil and rests seductively on a bed of arugula, like Victoria's lithe Italian secret sister. For a deft hand with seafood, try the gamberi al vino. The large shrimp are succulent, simply seared with white wine, garlic and lemon juice and then finished with a thickening of melted butter. I had to turn to one of don Paolo's specials, though, to feel his full culinary assault and gain a better measure of understanding of things to come. Normally I don't dwell on specials, but this clearly was a showcase for the new chef, delicately and diplomatically shifting a menu from past to future. 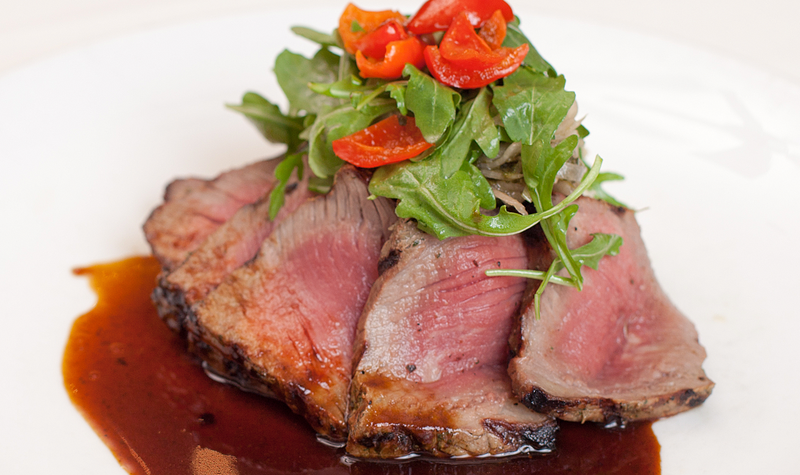 Italians have a fondness for veal. Most dishes follow the scaloppini school, pounded thin, breadcrumb-coated and sautéed, such as vitello saltimboca, a cut cooked with slices of prosciutto, fresh sage and marsalla wine. Valentino's was the best I've had in a long time, with true sage flavor and salty cured ham that did indeed jump in my mouth as the name implies. The special, though, is a veal cut not seen very often these days. Eight luscious chops still joined make up a small curved rack. They're roasted with clarified butter and fresh herbs to a rich russet brown. 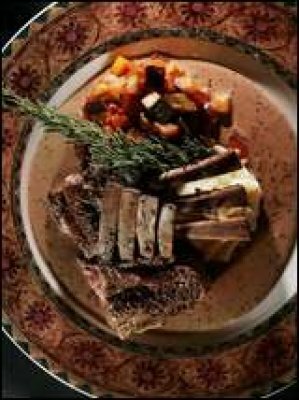 Chef Tramontano then deglazes the pan with red wine, adds Dijon mustard, shallots and veal demi-glace and reduces it to tremendously rich sauce, with just enough tart bite of the mustard that marries perfectly with the tender-sweet veal. Clearly, these are not the sauces of yore. Even a simple side of pasta con marinara was lemony bright, and vegetable accompaniments were tender babies brushed with olive oil and lightly grilled, full of flavor. If you want to know how good grilled seafood can be, the grigliata mixta brings together a lobster tail, scallops and shrimp that have marinated gently in the welcome trio of olive oil, garlic and lemon. They remain tender and moist with the full flavor of the grill's hot flames. Valentino's still serves its classic take on tiramisu, more of a folded layer cake than the usual stacked square affair. Tramontano also makes his own panna cotta daily, demonstrating just how creamy a custard can truly be. Through it all, servers maintain friendly and casual contact but with a professionalism of experience in finer restaurants, like one who intimates that he did hard time at Mario's, linking him to the old-school past. I'm anxious to try more specials and bask in the food of a confident chef who understands the beauty of classical simplicity. Grazie, Paolo, grazie. Food writer Jim Myers is The Tennessean's restaurant critic. He can be reached at 726-5961 or [email protected]. Reviews are written from anonymous visits to restaurants. Negative reviews are based on two or more visits. The Tennessean pays for all meals. The rack of veal special at Valentino's shows chef Paolo Tramontano's take on the classics. HOURS: 11 a.m.-2 p.m. Monday-Friday; 5-10 p.m. Monday-Saturday for dinner. FOOD: Classic Italian fare of pastas, veal and seafood, with a focus on lighter, fresher fare and seasonal dishes. Specials showcase the chef's Neapolitan roots. SETTING: An old house along what used to be a residential street, with two dining rooms and a bar on split-levels. Decor looks a little dated, but is attractive, especially the brick-walled upper dining room. SERVICE: Professional and informed, but with a comfortably casual feeling. COST: Appetizers/salads, $6.75-$14 (for tableside Caesar salad for two); pastas, $17.25-$24.95; entrees, $18.95-$32.95. CREDIT CARDS: Visa, MasterCard, Amex and Discover. BAR: Full bar, very good wine list with high-end Barolo's and Super Tuscans and a good variety of affordable bottles.